Jace Beleren has come to Innistrad searching for the vampire lord Sorin Markov, who he hopes can help him unravel a puzzle. But Innistrad is unfamiliar territory, and the only person Jace knows who might be able to guide him is likely to be less than helpful—particularly given the way their last encounter ended. Horses' hoofbeats drummed a leisurely rhythm. The jagged mountains of the province called Stensia loomed ahead of them, but Jace's goal wasn't far beyond the border, and he had read enough of his guide's thoughts to know that they were close. "I don't know why I'm even bothering with her," said Jace. "I know better." "Mm," said his guide. He was weathered and bearded, a man of few words. Jace had started filling the silence out of boredom, and had eventually gotten around to the subject of his visit. "I mean, I've made a lot of bad decisions in my life, even just counting the ones I can remember. And an awful lot of them involve her." A chill rain fell from patchy clouds, and something howled in the night. Jace had only been on Innistrad for two days, and he already hated it. The only saving grace so far was a new leather coat he'd bought to keep the rain and some of the cold at bay. "Hell, part of me's hoping she'll throw me out on my ear and I can be done with her." The full moon peeked out from behind the clouds, its huge silver face marked with a shape that the locals called a heron. Jace could see the resemblance. "Problem is, I actually need her help this time," he said. "Ahhhhh," said his guide, a strangled sound that Jace took to indicate boredom. "I'm sorry," said Jace. "I shouldn't be burdening you with my problems." He prepared a spell that would cleanly excise the last few minutes of conversation from the man's mind. "Ahhhhhrrrrrrrrrgggggghhhhh," said his guide. Not boredom. Anger? Jace reached into the man's mind—and hit a wall of pure, all-encompassing rage, the savage half-thoughts of a predator. His guide turned to him, accompanied by the stomach-churning sounds of bones cracking and clothes tearing. His face had bulged horribly, one eye grown large and yellow, his jaw jutting outward. Both horses shifted nervously. The transformation was complete in moments. Fur sprouted over the man's body, claws erupted from his fingers, teeth grew long and sharp, and his face elongated into a muzzle. The guide's horse panicked beneath him, and the man—the wolf-man—sank its teeth into the horse's neck. Jace spurred his own horse to a gallop, past the thing that had been his guide and the terrified, screaming horse. He was close. He could get there on his own. Behind him, the horse's scream was cut short with a wet crunch. The werewolf let loose a full-throated howl, and howls broke out in answer from the woods around them—one, then two, then more, mingled together until he couldn't be sure how big the pack might be. Jace's moonlit gallop ate up the road, faster than was safe. He saw the lights of a large manor house ahead, tantalizingly close, but a ravine yawned before it. He jerked the horse's reins to the left and stole a glance backward. There were at least three of them bounding after him, hideous amalgamations of human and wolf. They weren't like the krasis experiments of the Simic Combine, whose parts always seemed to show that they had come from separate species. Human-like hands with sharp claws, muscular arms covered in fur, lupine faces that nonetheless held a spark of intelligence—these were almost fully human, and almost fully wolf, all at once. He'd heard of werewolves, but had hoped never to see them. Jace let his horse run as fast as he dared, the lights of the manor taunting him. The trail wound around the ravine, cut through thickets, and splashed across little rills that tumbled noisily into the ravine in the darkness to his right. He couldn't hear the footfalls of the wolf-things over his horse's hoofbeats and the furious pounding of his own heart. He sent an illusionary double of himself tumbling from the horse behind him. His duplicate rose and assumed a fighting stance, but the werewolves ran right through it. He risked a glance back and saw five of the things gaining on him, nostrils flaring. Scent. Of course. They'd disregard anything that didn't smell real. He summoned another illusion, this one with substance and form. 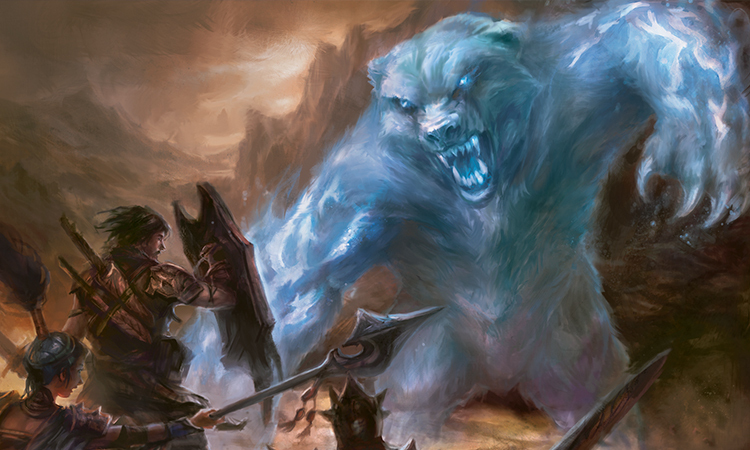 A hulking bear made of shining blue light took form behind him, a being of pure magic rather than a trick of the light—but still with no scent. The werewolves ran toward it, heedless, thinking it was another insubstantial phantom, as it rose up on its hind legs in a threat display. It lunged and tackled one of them, and Jace glanced back to see the two combatants fall in a furious tangle of fur and light. As he turned forward again in his saddle, his horse stumbled, just for a moment. It was enough. In a few breaths the rest of the pack was close behind him, claws swiping and jaws snapping. Their breath was hot and rank, steaming in the cool night air. Jace extended his mind and found the one that had been his guide, the one whose thoughts he had already touched. Now its mind was a chaos of hunger and anger, but Jace still recognized the memories and inclinations of the man he had hired to guide him into Stensia. Interesting. Jace's mind worked its way into the werewolf's, buffeted by thoughts of tearing and biting and eating. In the werewolf's vision, the moon was swollen in the sky, its light a baleful red, the heron leering and lurid. At last, the connection was complete. Jace was in control. His guide lunged sideways, snapping at one of the other pack members, the one that the wolf-man's dull thoughts identified as the alpha. Jace only took control for a moment, but it was enough—the alpha swiped back at her attacker. Jace's guide, now back under its own control, growled and fought back. They didn't seem to have communication sophisticated enough to say the mind mage made me do it—although even among speaking beings, that excuse didn't usually work. Soon the two wolf-things were circling each other, the hunt forgotten, and another—a mate? Another challenger?—stayed behind to watch them. That left Jace with one assailant. But the trail now hugged the ravine in treacherous switchbacks, and it took all of Jace's attention to keep his horse on the trail. The poor horse was frothing now, exhausted and panicked. Jace could almost feel the werewolf's hot breath on his neck. He looked back—he was imagining it, but not by much. 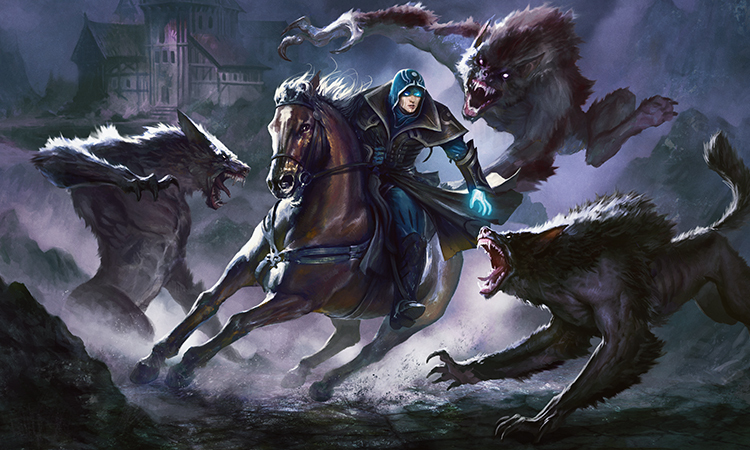 The agile creature could navigate the switchbacks much better than Jace's horse, and it was gaining fast. At last, the terrain opened up ahead of him and the ravine curved away, leaving nothing but a flat, muddy road between him and the welcoming lights of the manor. And not just any manor, he realized as it loomed. Her manor. His destination. Hopefully she'd forgive him for bringing a guest. He was within shouting distance of the gate when the werewolf struck. One claw raked sideways across the horse's rump, sending its rear legs tumbling sideways. Jace sprang from the saddle, landed in the mud, and rolled. He clambered to his feet and started running. Behind him, the werewolf attacked the fallen horse with a growl. The gates were closed and locked, with no doorman, and the yard was dark. Jace looked back over his shoulder to see the werewolf look up from the horse's carcass, muzzle bloody in the moonlight. It rose and stepped toward him, the horse forgotten. Breaking and entering, then. Even better. He calmed himself and focused on the lock, pushing away all thoughts of the monster behind him. Jace's telekinesis was weak—no stronger than his own muscles, and far more exhausting to use—but his fine control was good. Invisible mental fingers felt around inside the lock, found the tumblers, and quickly twirled them into place. The lock released with a click, and Jace pushed against the enormous black iron gates. They were stuck—rusty, maybe—and Jace had to shove. They opened with a squeal loud enough to wake the dead, and Jace stumbled into the yard and fell to his knees. He turned and kicked the gates shut behind him, then mentally sent the tumblers in the lock spinning back into place just as the werewolf slammed into the gate. Jace crawled backward, away from its reaching claws, but the werewolf sniffed loudly—once, then twice—and then it was gone, off to hunt some other prey. Something moved behind Jace. He rose to his feet and turned. In the darkness of the manor's yard, he could just barely make out a dozen figures standing silently around him. Now he smelled it, too, the stench of rot that had sent the werewolf on its way. A quick mental check confirmed it—there were no minds in these bodies. They were dead. The zombies stopped, then stirred and parted, leaving him a clear path to the mansion's ornate door. A welcoming committee. Her hospitality was everything he'd expected and then some. He walked among the gathered dead, trying to ignore them, as he got his first real look at the house. It was large, with enough rooms for a substantial family and servants, but none of the rooms seemed to be lit by anything more than an eerie purple glow. One corner rose into a stone tower that looked like newer construction, crowned by a complicated metal apparatus whose purpose Jace couldn't discern. It looked like something an Izzet electromancer would build right before being hauled off for psychological evaluation. Just as he reached the top of a small flight of stone stairs that led to the entryway, the door swung open to reveal a dark hallway. He stopped at the threshold. Another zombie stepped out from behind the door, this one clothed in some mockery of a servant's livery, and beckoned for Jace to follow. Fine. Jace lowered his hood and followed this new guide, surprised to find that the smell was musty but not foul. Must be some spell to keep the help fresh. At last, his guide led him into a large room illuminated by moonlight and spellcraft, where half a dozen zombies shuffled about. 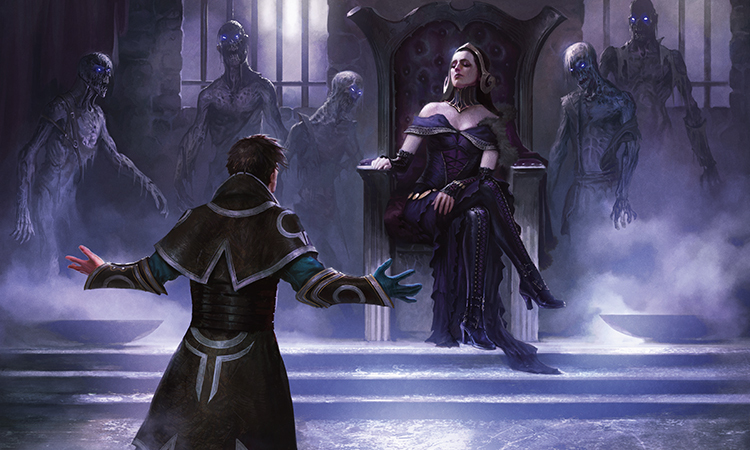 And there, sitting easily on a chair—more a throne—was Liliana Vess. She shut a large, leather-bound tome she'd been reading and handed it to one of her undead servants. "Hello, Jace," she said. She looked him up and down in obvious appraisal. "Nice coat." She rose and walked toward him, her movements as fluid and languorous as a cat's, and stopped when she was standing just slightly too close to him. She studied him with those ancient violet eyes, took in his face one detail at a time. She must be quite aware, it occurred to him, of how his muscles moved beneath the skin. This time he looked her in the eye, despite the memories it dredged up. She reached up to his face...and flicked the tip of his nose. "Just making sure you came in person," she said. "I can make my illusions solid, you know," said Jace, rubbing his nose. "Oh yes. But I doubt you can make them yelp so convincingly." "I was hoping for a warmer welcome," said Jace. "You've got some very disagreeable neighbors." "I heard," she said. "There's worse out there than werewolves." "Angels," she said with disgust. "Your feelings on the subject are well documented," he said. "Personally, I'd have been thankful for a little angelic assistance out there." "That's not—" said Liliana, then cut herself off. "Well. Who you choose to trust is your own business, I suppose. But I wouldn't trust an angel if I were you." "My default stance is to trust no one," said Jace. "Nothing that's happened so far has changed my mind." "Clever boy," she said. "Something to drink?" Liliana walked back to her throne and sat, as a zombie shuffled forward with a bottle of...something. "Thanks, but I'll pass," he said. Liliana poured herself a glass and sipped from it. "Now then," she said. "This is a first. To what do I owe the pleasure?" "I..." Jace weighed pride against practicality and finally reached a decision. "I'm here to apologize." Liliana raised an eyebrow in feigned curiosity. "Really? Whatever for?" "For leaving Ravnica with...unfinished business between us." "For abandoning me, you mean," she said, with a cruel smile. "And heading off to some wilderness plane with that walking anatomical diagram." Gideon, she meant. Jace stifled a laugh. "I doubt he'd take that as a compliment." "It is!" she said. "He'll make a perfect corpse, if he gets around to dying before it all goes soft." "And I'm certain he wouldn't take that as a compliment," said Jace. She always had to push. "So you regret going with him?" said Liliana. "Oh, I wouldn't say that," said Jace. "We did good work. Saved the whole plane, in fact, with help from two other Planeswalkers." "We even took an oath, to...to keep doing this. Keep going after interplanar threats." "Lovely," said Liliana. "Very heroic. And now...what? You're here to ask me to join your little club?" "No," said Jace. "I know you better than that." Liliana waited. She knew him better than that, too. "I considered it, of course," he said, with a shrug. "You could use a few friends to watch your back. But I knew you wouldn't go for it." "I'm not interested," said Liliana. "In your friends, or your oaths." "I didn't think you were," said Jace. "Jace, I know you're not here to recruit me," she said. "You're not here to help me. And you're not here to apologize." "What makes you say that?" he asked, then added: "I did apologize." "You said it yourself," she went on. "I betrayed you. I cursed Garruk. I still have the Chain Veil. I've never been a friend to you, not really. And you know, I never did ask for your help. Has any of that changed?" "Which means that you're actually here because you need something from me. You know I have troubles, and you think you can make a deal." She waited long enough for him to say "I—" then cut him off. "Prove me wrong," she said. She stood and raised her head proudly. "I refuse your freely given aid, Jace Beleren. If you're here to help me and ask nothing in exchange, turn around and walk out that door." Jace said nothing. Even if it was a bluff, he couldn't afford to call it. "All right then," said Liliana, draping herself back over her throne. "Now that we both know exactly how much our personal history means to us...what can I do for you, dear?" She smiled, predatory and alluring. She could be quite magnanimous, provided she was in complete control of the situation. "Out of curiosity," said Jace, "would you really have kicked me out if I were just here to help you?" "Fascinating question," said Liliana. "If it ever comes up, perhaps you'll find out." She took a sip from her glass and waited. 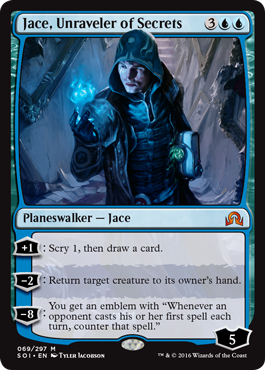 "I'm looking for Sorin Markov," said Jace. Liliana's face betrayed genuine surprise. Jace let himself take a little pleasure in that. "Jace, do you know what you're asking?" she said. "Do you know who he is? What he is?" "I know he's a vampire, the so-called Lord of Innistrad," said Jace. "I know he's ancient and more than a little untrustworthy, and I know right now he's either in trouble or causing trouble. Either way, I need to find him." "Short version, then. Three Planeswalkers worked together to trap extraplanar, world-devouring monstrosities called the Eldrazi on Zendikar. Sorin was one of the three." "Really?" said Liliana. "That doesn't sound like him." "My source—one of Sorin's old allies—said he did it out of a sense of...'high-minded self-interest,' something like that. He knew that eventually the Eldrazi might make their way to Innistrad, so he cooperated to trap them somewhere else." "And then...you let them out," she said, smiling. "Am I remembering that right?" He wished she weren't enjoying this quite so much. "Yes," said Jace. "Manipulated and coerced, two other Planeswalkers and I inadvertently released the Eldrazi titans from their prison. Sorin showed up, briefly, then departed after trying to use some kind of failsafe to keep them in. He was supposed to meet one of his allies, my source, back on Zendikar, but he hasn't shown." "That sounds more like him," said Liliana. "Of course, now there's no need for him to go to Zendikar," Jace went on. "But the Planeswalker I was working with won't speak to me anymore, and Sorin and the third member of the trio are missing in action. I'm worried that a certain dragon Planeswalker might have taken an interest in them...but you wouldn't know anything about that, would you?" "I told you, I don't work for him anymore." "You have many fine qualities, Liliana, but scrupulous honesty is not among them." "Jace," said Liliana, "listen to me. Sorin won't help you. You think I'm selfish? You think I'm cruel? Sorin's had thousands of years to get used to the idea that humans are cattle and mortal lives are cheap." "I met him," said Liliana. "Once, shortly after I first arrived on Innistrad. He sought me out, tested my strength in battle, and pronounced me too weak to be a threat. Then he told me that Innistrad was his, and that I'd best be a civil guest—or he'd find me and kill me." "Charming," said Jace. "When was this?" "Long ago," said Liliana. "And yes, that kind of run-in was a lot more common then. But I see no reason to believe he's changed. 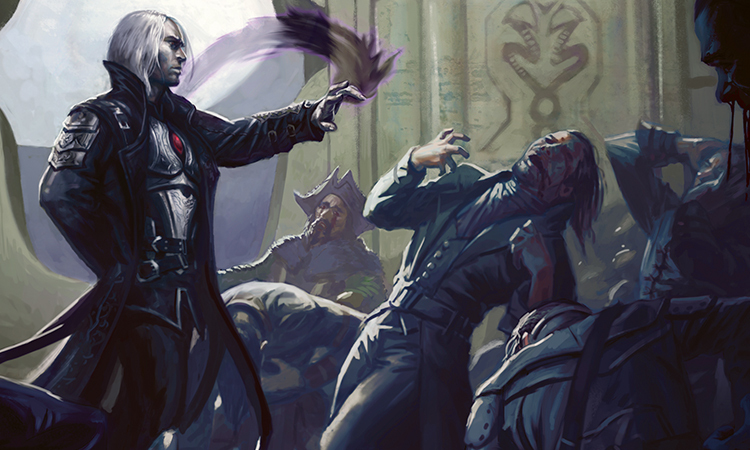 Sorin has no more reason to be friendly to you than this other Planeswalker you've been talking to, and his take on not speaking to you might just be to kill you. Don't go." "That's not an option," said Jace. "He's ancient, he's ruthless, and he's powerful. You're in over your head." "I'm in over my head?" said Jace. "You're one to talk." "Yes," said Liliana. There was no more mirth in her voice. "I am. And I am telling you, don't go. He's not going to help you, and you can't clever your way out of being killed by a millennia-old vampire." "If I didn't know better," said Jace, "I'd say you were concerned for my safety." "Don't make this about us!" she said. "You wouldn't be here if you didn't have something to offer me. I'd like to find out what it is before you throw yourself on Sorin's sword, if it's all the same to you." "If you're that worried about me, come along. Maybe you can introduce us." "What?" she said. "No. I already told you, I have my own problems, and my own solutions. And I don't care how much help you think you can be to me in exchange—none of it does me any good if Sorin kills both of us. And that's assuming we can even find him, when the roads out there are worse than ever. I'm not going anywhere." "Fine," said Jace. "I was hoping you could help me, but I guess I'll have to follow the only lead I have left. Markov Manor is that way, right?" He pointed in what he was fairly sure was the right direction. "Markov Manor?" she said. She rolled her eyes, grabbed his wrist, and moved it several inches. "Jace, that's even worse!" "It's his ancestral home, right? Wouldn't his family know where he is?" "Do you know anything about Innistrad?" Liliana snapped. "Or did you just see 'Markov Manor' on a map and think, 'Hey, great, there's no way that could result in me being brutally murdered'?" "I read a few minds, but they didn't know much," he said. "Why, what am I missing?" "Sorin's a pariah among his own people," she said. "He hasn't been welcome in Markov Manor for hundreds of years at least. Maybe longer. If you show up asking about him, they'll kill you or worse." "Even so," said Jace, "if you won't help me, I don't have much choice. Markov Manor is the best lead I have." Liliana settled back in her chair. Her expression hardened, and her eyes began to glow purple. Her zombie servants lurched forward. Jace's heart pounded. "Lili, what are you doing?" "Making a point," she said. Too close. They were too close. Jace cast a quick invisibility spell, but the zombies still stumbled toward him. Half of them didn't have eyes anyway. A cold hand clamped around his arm. He concentrated, and a cloud of illusionary duplicates sprang from his body. 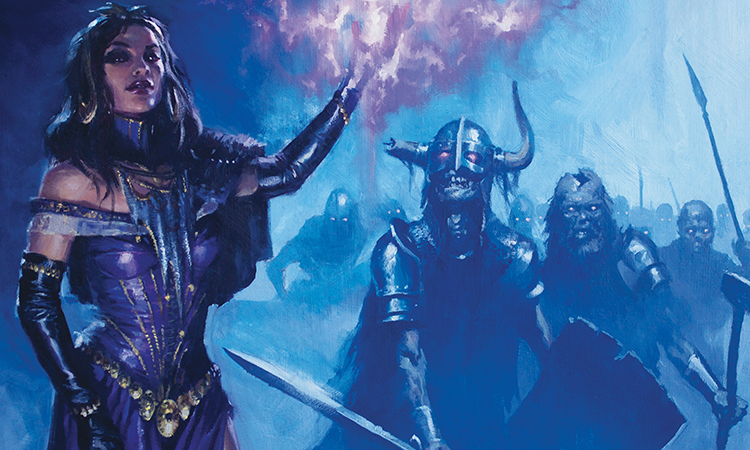 Half a dozen Jaces, casting spells or diving for the window or running to attack Liliana. The zombies ignored them. Now there were grasping hands all over him, the mob of zombies pushing him against the wall—frigid stone, icy flesh. Fingers closed around his arms, his legs, his throat. Sleep spells, illusionary bindings—the zombies were immune to some of it, and there were too many of them for the rest. Jace was helpless. She wouldn't really hurt him. Not without a reason, anyway. "Lili," he choked out. "I'm no good against the dead, but I can fight...a necromancer. If this were a real fight, I'd have blanked your mind by now." The zombie mob stopped, holding him in place. "Perhaps," she said, rising and walking toward him. "Of course, without my control, they'd tear you apart. Wouldn't be much consolation to me...but I doubt that would be much consolation to you, either." She stood over him, the zombies parting so she could glare down at him. "This world is dangerous," she said. "For you especially. And you can't beat an ancient Planeswalker whose mind you can't—or won't—touch." She seemed very alien in that moment, bathed in moonlight and necromantic power. He sometimes forgot how old she was—a century older than him at least, a relic of a time when Planeswalkers were something more and less than human. And Sorin was far older. "This is a dead end," she said. "Go home, Jace. I'm sure you've got forms to file." Undead hands released him, and he rose, rubbing his throat. He felt the sudden need for a bath. "I'm sorry for bothering you," he croaked. "I'll head to Markov Manor on my own, then." "Nine hells, you are a reckless fool!" "Of course I am," he said. "That's how I got tangled up with you. I'll be going now." He turned to leave again, trying not to think about moonlight and bloody muzzles and Liliana's eyes and the fact that his guide and his horse were both gone. "Don't be stupid," she said. "You can leave in the morning." "Really?" he asked, incredulous. "After that grand display of mutual indifference, you're asking me to stay the night?" She walked toward him and leaned close, her lips almost touching his ear. His throat tightened. "Indifference," she whispered, "doesn't make your heartbeat quicken or your face flush." He could feel the warmth of her body, but her breath on his cheek was cold as ice. The chill lingered as she stepped away. A momentary impulse fled back into the shadows, where it belonged. "Don't flatter yourself," she said aloud. "I have a guest room." "In the basement," she said. "More a dungeon, really." "The servants will show you to your room," she said. "Good night, Jace." She turned, standing in the moonlight, looking back at him from a distance that seemed much longer than it was. "Until morning," she said firmly. "After that, you're on your own." He hesitated, wanting to say more, unsure what to say. Liliana walked away, out of the beam of moonlight, and vanished into darkness.